Okay, so you start with a screen like this, with a big 1 in the corner and it all looks so scary and confusing you begin banging your head against the computer, right? Pickle did. Section summary is for you. It’s what you see in your graph. Your reader will never ever see this. Go ahead, select the circle marked “1” and type something in. You’ll see that whatever you type in now appears in the graph. Magic! 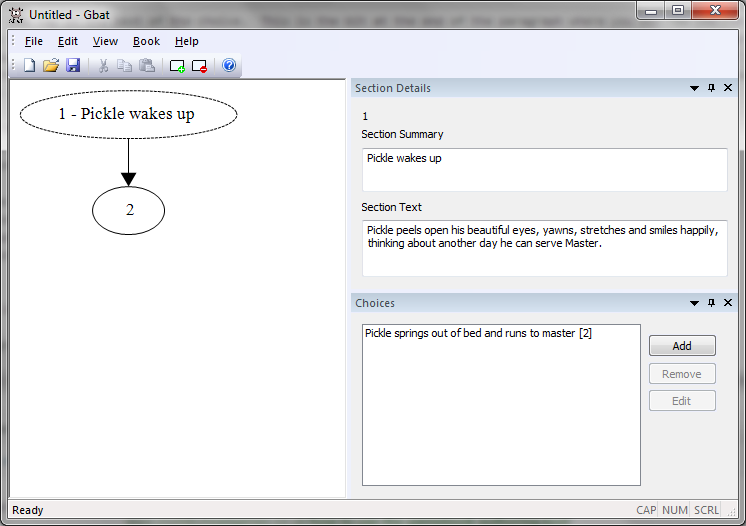 Master recommends you keep your summary unique, so you know exactly at a glance where you are in the book. Now this is the part your reader will see when you export your book, so this is the part your make beautiful and interesting! 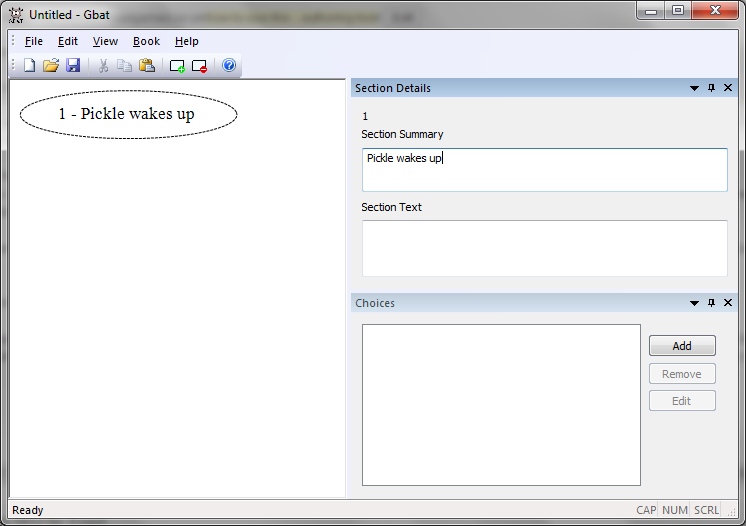 Type your text into here, and this will appear in your final book. The graph is unaffected by what you type in here. 1) Section summary is to help you, the author. It’s the text that appears in the bubbles in your graph. 2) Section text is for your reader. Make this wonderful, because this is what they see when you build your book! Pickle really loves choices. What should Pickle wear today? What should Pickle cook for Master today? How can Pickle stop Master being mad at Pickle today? And so on. This would be a very boring choose your own adventure book though, so once you press okay make sure you add other choices! Oh! But looks what happens when you create your first choice! 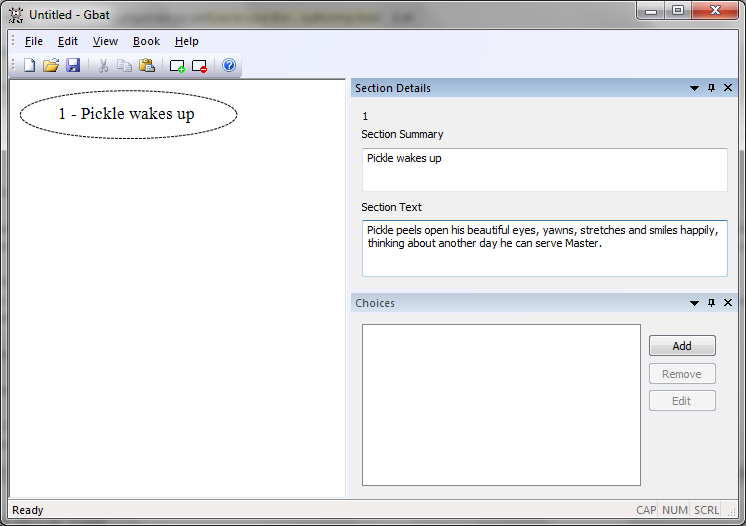 This is by far the sexiest thing that the GameBook Authoring Tool does. Every time you create a choice and link it to a new or existing section, the graph is updated. Here, you can instantly see how every choice in your book fits together. A full map of your book, the sections and all the choices between them is always available. Pickle loves it. Okay, so what happens at the end? Pickle keeps going on about exporting this and that, but what does it mean? How can Pickle’s friends see Pickle’s book? Well, Pickle has no friends, but Pickle is sure that you do. So what you do, once you write all of your sections, all the section text and all of the choices, is press “Export” (this is under the file menu). 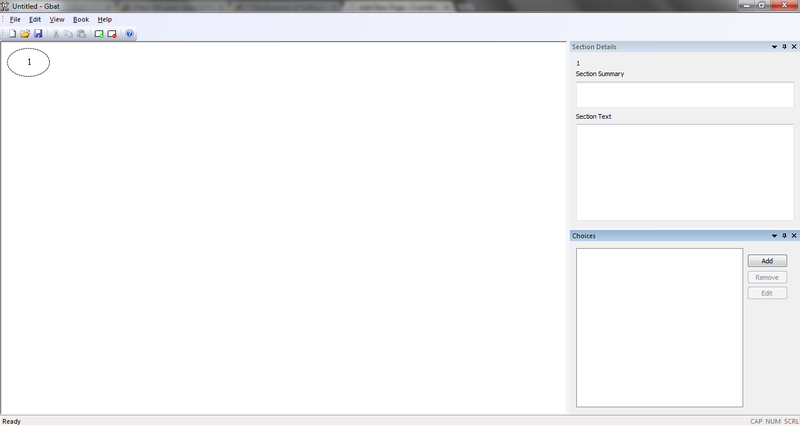 Then you choose a file format, for example rtf, and press save. 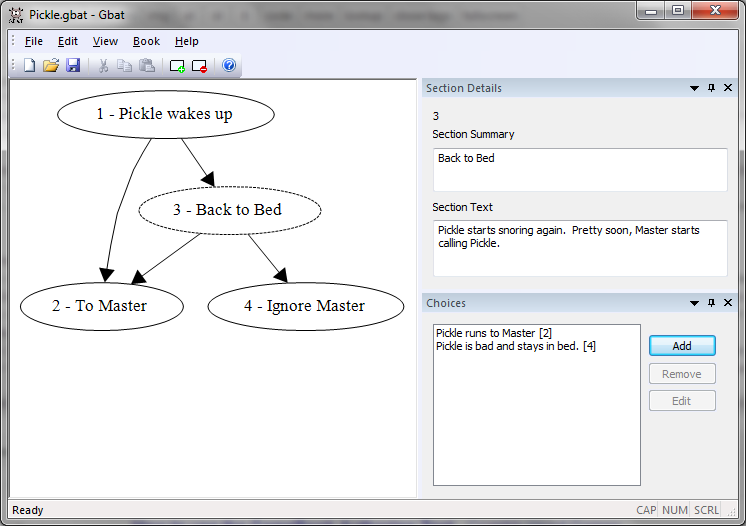 The pixies in your pc run around and generate the text and the structure of your interactive book! A book pops out the other end! This file you can share with your friends! What is the GameBook Authoring Tool?